Here are my top Halloween safety tips for kids, to make sure they have a fun and still safe time while dressing up and going trick or treating. One of the best parts of Halloween is dressing up in a costume. It can be loads of fun. Here's tips to make sure your child's costume selection stays fun, and is still safe at the same time. Make Sure Costume Easy To Walk In: You can have some pretty cool costumes, either store bought or homemade, but not all of them are suitable for trick or treating (especially out in the dark) unless your child can easily walk in them. That means there can't be any tripping hazards, too big or wobbly shoes, or blocked vision from masks. Skinned knees and busted lips from tripping will not make a happy Halloween! Special Word About Masks: Masks are very common on Halloween, but they can easily block air flow, and more commonly impede vision. Either use makeup, instead of a mask, or choose one which is well fitting, and has adequate eye holes for full vision, including peripheral vision, and adequate air flow for breathing. 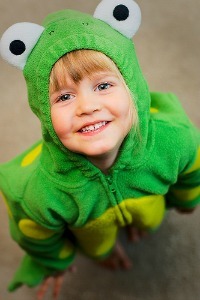 Make Sure Costume Is Flame Resistant: Store bought costumes are required to be made of flame resistant fabric. This doesn't mean they won't catch on fire, but instead that they don't catch as easily, and can be put out more readily than some other fabrics. Homemade costumes, on the other hand, aren't regulated. Make sure you condsider this issue before placing your child in any costume, where they (or their billowing cape, sleeve, skirt, etc.) could get close to a source of flame, such as a Jack-O-Lantern. Test All Makeup On Skin Before Applying: Often, when putting on costumes, we also apply some makeup to our children's skin. They typically love this, but remember that many kids can be allergic to some or all of these items. It is much better to test the makeup first, on a small patch of skin, for example on their arm, before smearing it all over their face and close to their eyes. Wait at least 15 minutes (perhaps evern 30) to see if any reaction occurs from the test patch before applying everywhere. Plus, make sure to remove the makeup after the night is over, before bed time, so it doesn't smear on pillowcases and also doesn't get into eyes which can irritate them. Refelective Tape On Costumes: Trick or treating often occurs at dusk, and when it is dark. Make it easier for drivers and others to see your kids by adding relective tape to their costumes in strategic locations, especially if your child has a dark costume. Further, you can also add relective tape to everyone's Halloween bags or baskets. Costume Accessories Should Be Soft & Flexible Costume accessories, such as knives, swords, etc. need to be soft and flexible to prevent injuries. Kids can get a bit wild playing with these things, and you don't want any injuries, especially from a poke in the eye. 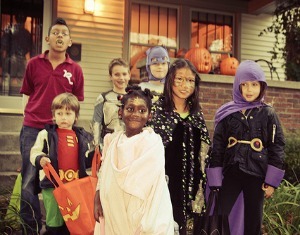 Never Go Alone: Never let your child trick or treat alone, but always in a group. Further, for young children, especially, having an adult along is a must. Consider A Glow Stick: I mentioned above, when discussing costumes, that trick or treating normally occurs in the dark. 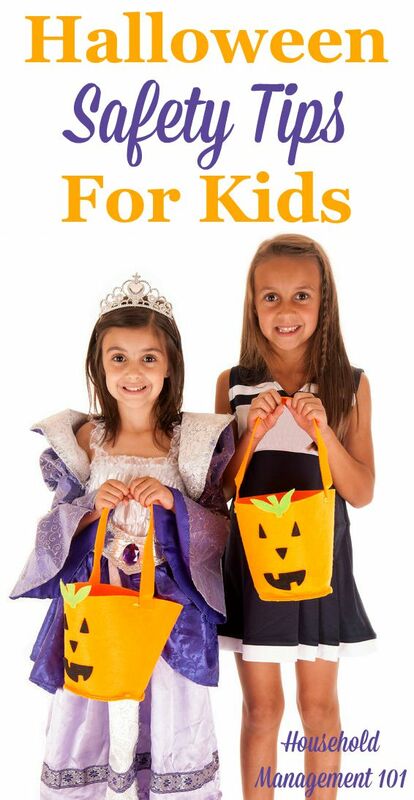 Along with reflective tape on the costumes, consider giving each child a glow stick, bracelet, or necklace, etc. to help them stand out from the dark night. Take A Flashlight With Fresh Batteries: Similarly, providing each child with a flashlight, with fresh batteries, makes them more noticeable to drivers, and also helps them see better in the dark, so they don't trip on an object while walking along. Exercise Caution When Getting Near Lit Candles: There is often lit candles on Halloween night, as part of luminaries or candles within Jack-O-Laterns, for example. Have your kids be mindful of these flames as they walk between houses while trick or treating, and don't get too close, so they don't catch their costume on fire on accident. Walk, Don't Run: Kids get excited when trick or treating, and who can blame them! It can be a blast. But, they need to walk, not run, between houses. They have on potentially bulky costumes, it is dark, and there is a lot of activity around them, which means they need to move more slowly to avoid accidents. Stay On Sidewalks Where Available: If your neighborhood has sidewalks make sure your kids stay on them, and don't run through yards to cut between houses since they can trip over things, furniture, lawn ornaments, flowers, etc. if they do cut through yards. If there aren't sidewalks be quite careful when walking to take care of these obstacles, and also cars. Consider Car Safety: Kids are out on the streets, at night, so they've got to consider car safety, such as not crossing the street without looking both ways (and preferably with a parent assisting them), only crossing at corners and cross walks, and also never darting out between parked cars. Never Go Into Strangers House, And No One's House Unaccompanied By An Adult: I always think Halloween is a bit strange, because most of the time we tell our kids not to talk to strangers, and then at Halloween we parade them around the neighborhood asking for candy from people we don't know, or know well. One thing is clear though, never enter a home of someone you don't know, and even causual acquaintances, don't enter their home without a trusted adult. 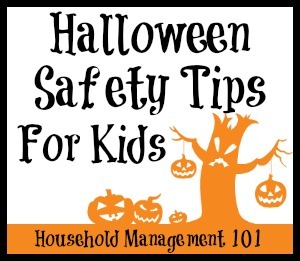 Kids Need To Know Safety Rules: These rules are important, so make sure you review them yourself, to supervise properly, but also review them with your kids and cut trick or treating off early if they can't follow them. Trust me, this threat will keep most of them in line! When trick or treating is over each child typically has quite a haul of candy and other treats in their basket or bag, and are eager to get home to gorge themselves. 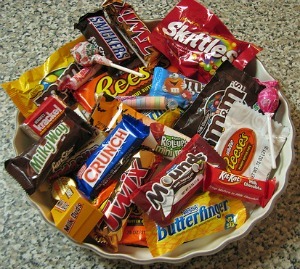 Inspect All Candy Before Eating It: Do not allow your kids to eat any of the candy they collect before you get home. Instead, once home take the entire bag of candy, dump it out, and inspect every piece. Accept only individually wrapped commercially purchased treats, and not ones that have been slightly opened or ripped (even if it appears it was an accident). 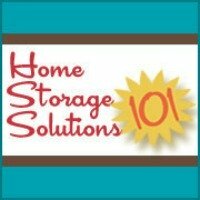 Never Accept Homemade Treats From Strangers: While homemade treats can be quite tasty, save these for ones your family makes itself, or from good friends and family members. Do not accept homemade treats from those you do not know or trust. Consider What Candy Is Safe For What Age Groups Plus Consider Allergies: Pay attention to ingredients in various treats, to make sure your child doesn't have allergies to them. In addition, you need to consider what treats are appropriate for the kids' ages. Don't forget to consider choking hazards, especially for small children. If you've got several kids, let them trade amongst themselves for appropriate candy for their age group and health needs. Don't Let Your Kids Eat Too Much Candy At Once Or For Too Long: Finally, don't let your kids eat too much candy in one sitting, especially the night of Halloween. If you ignore this you'll likely have to clean up a mess later when it comes back up. Plus, limit candy to about a week's worth, at most, and then throw the rest out. Kids don't need to eat sweets all the time. 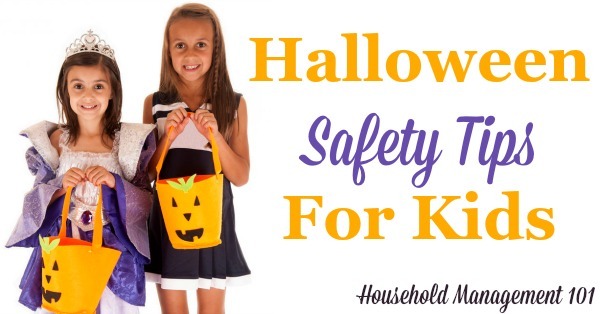 I hope these Halloween safety tips allow both you and your kids to have a great holiday this year, and make lots of special and fun memories!